I once again found a spot on the final turn and got a great shot of Silver Charm and the rest of the pack as they headed for the stretch. To order this photo, click here. While I was in New Mexico for a feature story in 1997, I also covered the Indian Nations Futurity Cup at Santa Fe. I met up with Eddie, one of Bob Baffert’s main assistants, who brought a young, immature 2-year-old named Real Quiet. He finished third in the $250,000 stakes. 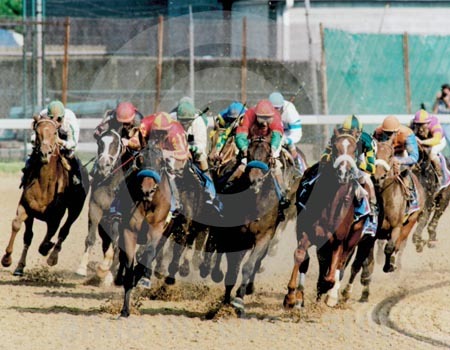 Indian Charlie was the Kentucky Derby favorite in 1998, and his stablemate was Real Quiet, who didn’t get much attention. Having seen Real Quiet as a two-year-old, and then at three as a mature athlete, I was impressed. Real Quiet was my bet and he won in impressive fashion. A well-bred son of Summer Squall, Charismatic with Chris Antley aboard was a flashy winner, holding off a late charge by Menifee. 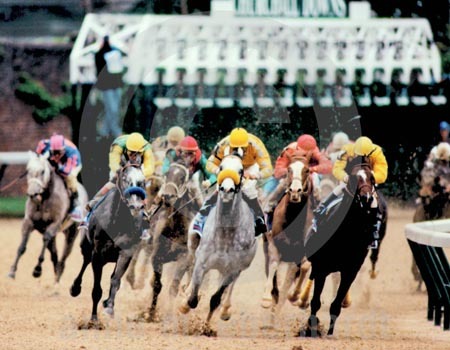 I still used film and the Nikon F5 camera for this Derby, but I had a chance to use the Nikon E3 Digital Camera that Nikon Professional Services brought to the event that year. The digital camera revolution was underway! Later that year I purchased the Nikon D1 digital camera. Fu Peg as many nicknamed him was a beautifully correct athlete that attracted many people’s attention. 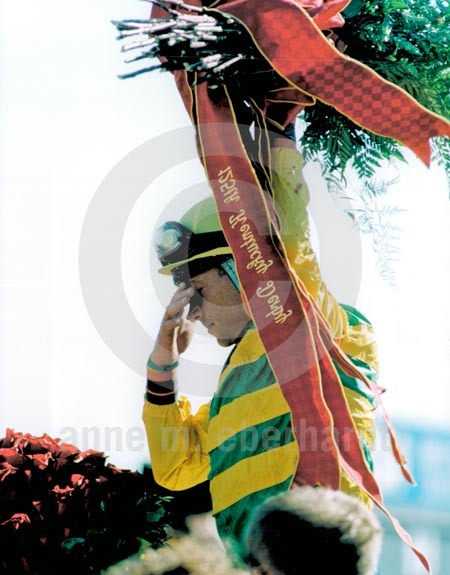 Fusaichi Pegasus was the first favorite to win the race since Spectacular Bid in 1979. He looked the part of a Derby winner. 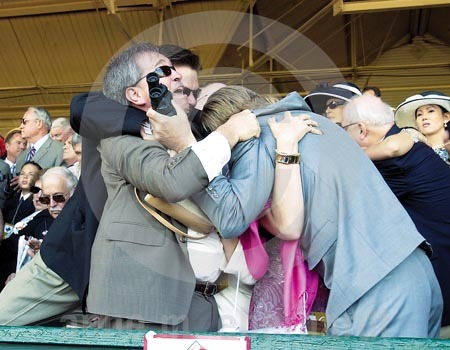 Photographing the owners as they rushed across the track and then the owners and horse with jockey in the winner’s circle, I used two Nikon F5s, one with a 35-70 and the other with an 80-200mm lens. 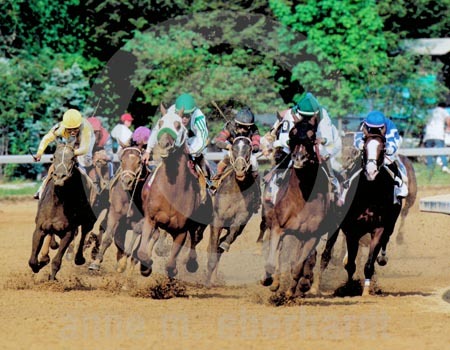 Taking the lead as the Derby field straightened for home, Monarchos (far left) recorded the second fastest winning time in Derby history. 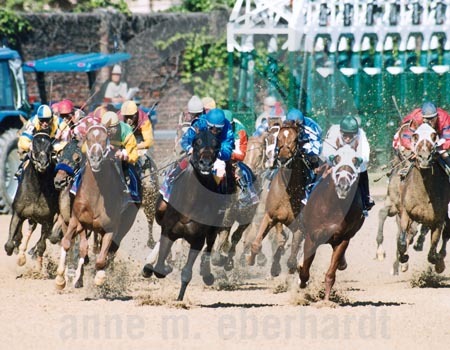 While my publisher was enthusiastic about jumping into the digital technology, we didn’t have enough digital gear yet to have everyone use digital at a major event such as the Kentucky Derby. 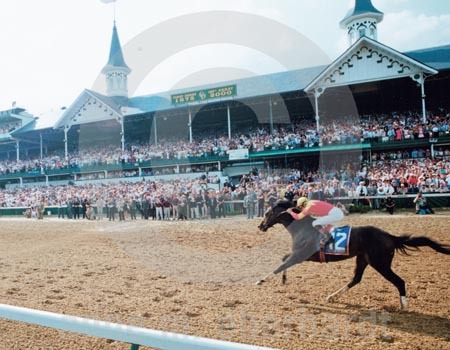 Taking the lead right out of the gate and pulling away at the finish, War Emblem gave all our photographers images that showed the Derby winner front and center. I, however, was in the owners box, and I was able to capture the celebration by trainer Bob Baffert and Jill Moss after the victory. 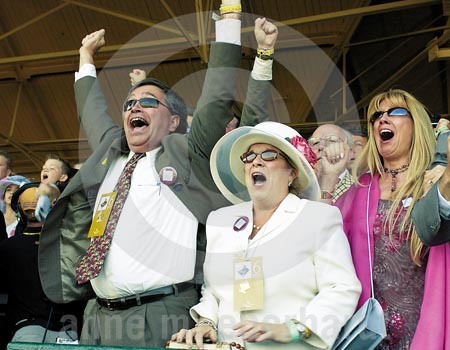 Enthusiastic owners make the shot. And Funny Cide’s ownership group was exceptional. 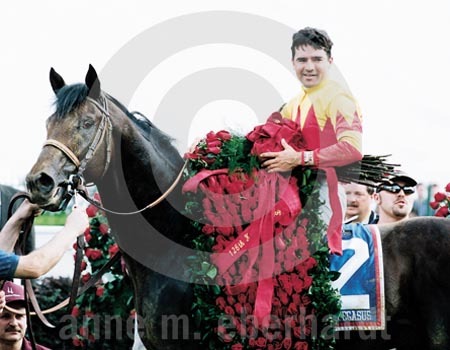 With so many owners and friends in their group, I concentrated on Jack Knowlton. The first New York-bred to win, Funny Cide also was the first gelding to win since Clyde Van Dusen in 1929. Well, the big day is almost here! Tomorrow I will continue our trip down memory lane and bring us to the 136th running. Hope you're enjoying this trip down memory lane as much as I am. Does everyone have their picks for Saturday? 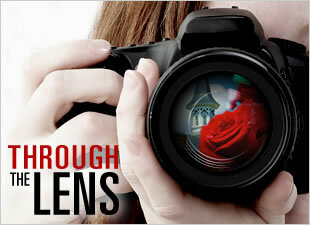 Visit Anne's Facebook Photography Page!